Welcome to Day Three of my #FrenchVillageBookworm Advent Calendar, where every day between now and Christmas I will be sharing a book with you and today I thought it was about time we had Christmas themed book. 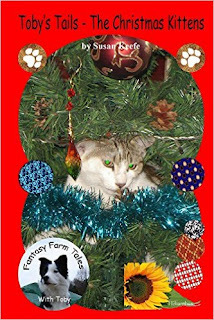 My review today is for Toby's Tails - The Christmas Kittens (Fantasy Farm Tales Book 5) a very sweet short story for children about Toby the Border Collie who lives on Fantasy Farm, a smallholding in France. In this book Toby tells us about the three little kittens who join his family, their antics as they explore their new world and their first Christmas, where they enjoy playing hide and seek in the decorated tree. There are some lovely pictures (real colour photos) of Toby and his kitten friends, which I’m sure will be enjoyed by both children and adult readers. The kittens are lively, entertaining and get into mischief, but Toby is on hand to help them settle into their new family and even holds their paws as they visit the vet for the first time. He is a perfect Dog-Father to the new little ones and happy to share his life on Fantasy Farm. There is a moral to this tale too and in simple language that children will understand it is explained why young animals do not make good gifts at Christmas. To help the non for profit French animal charity Hélianthus, founded in 2008, 10% of the profit of this book will be donated to them for their work that includes rehoming, fostering and spaying abandoned cats and dogs. There are four other books in the Toby’s Tails series for children and they are available in English, French and Spanish, in ebook and paperback format, links to Amazon can be found below. I have lined up books one to four on my kindle (in English) and I'm looking forward to reading more about Toby's life in France.